I have a new look for my blog. This is a surprise for me from Mr.IB and what a great surprise it is. I absolutely love it. Now moving on to today's recipe, I had half a bottle of pomegranate juice that I got from my local farmers market which I've been having daily for breakfast. I love pomegranate and make it a point to eat it or have the juice everyday whenever I can get it. Today I wanted to have cupcakes for breakfast and had cake mix in the pantry so I made these beauties. 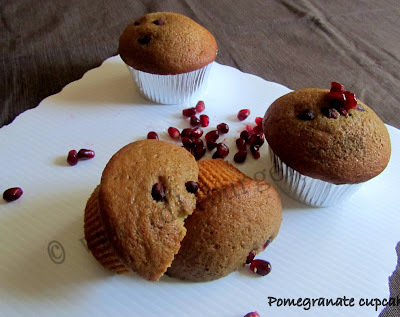 And instead of water I added the juice of pomegranate and they turned out perfect. 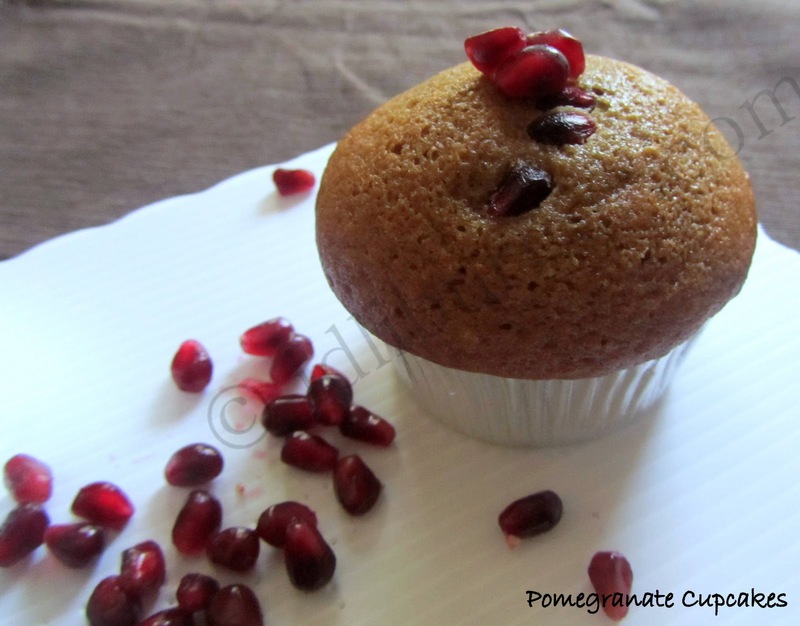 Follow the directions on the cake mix and substitute water with 1 and 1/4 cups pomegranate juice. Preheat oven to 375F with the rack in the center . Place a baking cup in each of the muffin cups. Divide the batter equally into all the baking cups, about half full. Add a 5-6 arils of pomegranate on the top. Bake at 350F for 21 minutes or a toothpick inserted at the center of the cupcake comes out clean. Great to be blogging buddies..